The Case Bowie Commemorative wall mount is a beautiful addition to any room in your home to recognize the service of U.S. Army personnel. Limited to 175 pieces, each one features the Case Bowie knife with polished 9.5" Tru-Sharp blade etched with "I am an American Soldier". 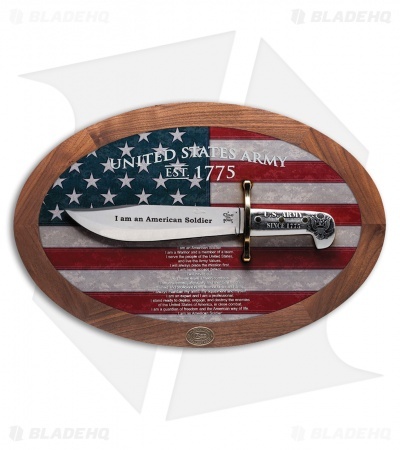 Laser engraved handle features the Army seal and date of organization with brass guard. The wooden display with American Flag background with the Soldier's Creed. Includes Case collectible medallion and Certificate of Authenticity. Measures 20" x 13.25" x 1.75".